We always enjoy attending the UKRI Cloud Working Group Workshop held annually at the awesome Francis Crick Institute. The sizeable crowd it draws and the high quality of content are both healthy signs of the vitality of cloud for research computing. This year's workshop demonstrated a maturing approach to use of cloud, with some notable focus on various methods for harnessing hybrid and public clouds for dynamic and bursting workloads. Public cloud companies presented on new and forthcoming HPC-aware features, while research organisations presented on mobility to avoid lock-in to cloud vendors. How these two contrasting tensions play out will be interesting over the next few years. There was also a welcome focus on operating and sustaining cloud-hosted infrastructure and platforms. 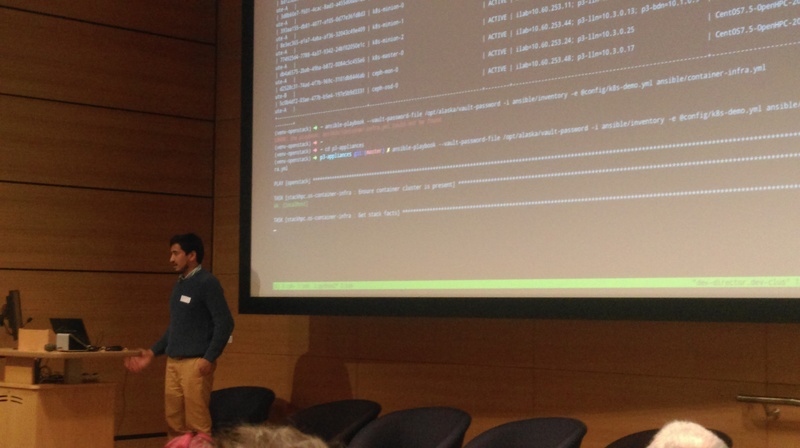 In particular, Matt Pryor from STFC/JASMIN presented their current project on a user-friendly application portal, coupled with Cluster-as-a-Service deployments of Slurm and Kubernetes, with focus on both usability for scientists and day-2 operations for administrators. StackHPC is proud to be working with the JASMIN team on implementing this well-considered initiative and we hope to write more about it in due course. We always particpate as much as possible, and this year StackHPC was more involved than we have ever been before. Five members of our team attended, and in a one-day programme three presentations were delivered by the team - a real achievement for a ten-person company. 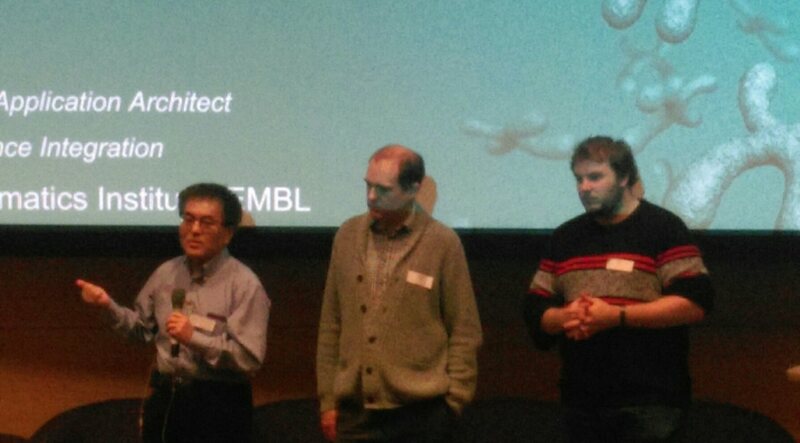 We presented three prominent areas of recent work. John Garbutt spoke about our recent work on storage for the software-defined supercomputer, in particular SKA SDP buffer prototyping and the Cambridge Data Accelerator. 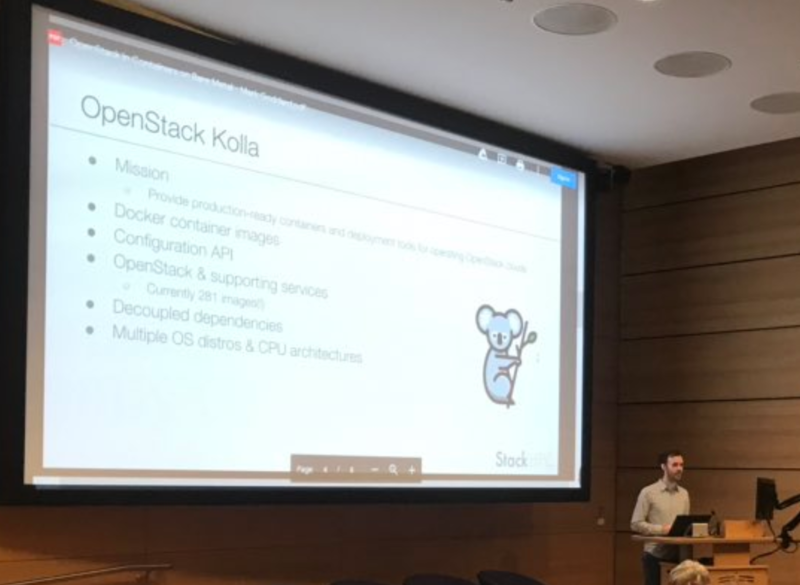 Mark Goddard presented our work on Kayobe, a free and open source deployment tool for containerised OpenStack control planes, based on Kolla and Kolla-Ansible, and embodying current best practices. Kayobe is seeing broad adoption for research computing configurations and use cases. Bharat Kunwar delivered a demonstration of Pangeo, the second of the day after Jacob Tomlinson presented the work of the Met Office Informatics Lab. With a focus on data-intensive analytics on private cloud infrastructure, Bharat demonstrated the deployment of Pangeo on a bare metal HPC OpenStack deployment, using Kubernetes deployed by Magnum. In addition to demonstrating containers running on bare metal, Bharat demonstrated storage attachments backed by Ceph and RDMA-enabled BeeGFS. All of that in ten minutes!